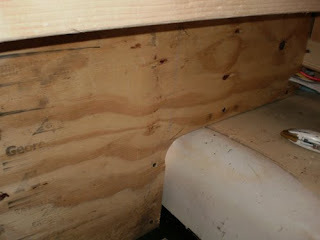 Today I started by installing a piece of plywood on the back wall of the inverter compartment (Under the Front Dinette Seat). This gives me a divider and a wall that I can install things on. 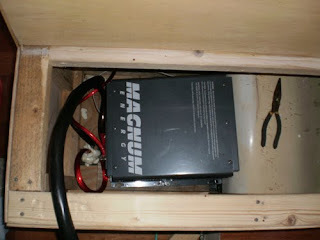 Next I made a base for the inverter to sit on. 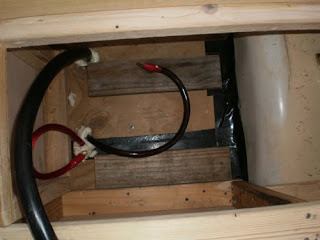 This will insure good airflow all around the inverter. 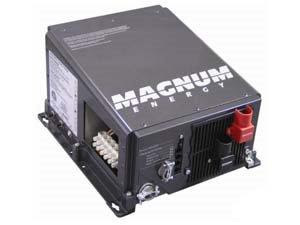 We found the Magnum ME Series 2012 Inverter / Charger for $450.00. We bought it from a guy some months ago that had purchased it and never used it. It included the remote and battery temp cable. Safe and Reliable: The ME Series is ETL Listed to the stringent requirements of UL/cUL 458 and CSA C22.2 #107/.1-01, ensuring that the inverter is safe and reliable. Easy-to-install: Install the ME Series in four easy steps: Simply connect the inverter's output to your distribution circuits or electrical panel, connect your power cable (AC) to the inverter's easy-to-reach terminal block, connect the batteries, and switch on the power. Power Factor Corrected (PFC) Charger:Our PFC charger is built into all of our inverter chargers. It uses less energy from a generator than a standard charger - using only 15 amps per 100 amps versus 23 amps used by standard chargers. Versatile Mounting Mount the ME Series on a shelf, bulkhead, or even upside down. Buy with ease: The ME Series is backed by a three-year 36 month limited warranty. Remote Control: For convenient finger-tip operation, including the new one-knobTM programming. 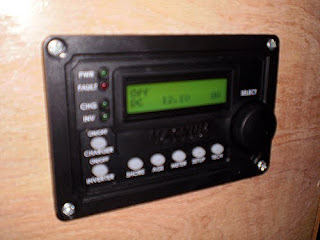 Here is the remote panel powered up.